Now this was a strange one. One of my customers and I was putting in a Check Point 4800 appliance with all the blades (App and URL filtering, IPS, etc). We were testing Internet connectivity and found that, on a 100Meg circuit, we had 89Meg down and 15Meg up. On the public side of the firewall, we got 90Meg down, 90Meg up. Hmm, it must be the firewall. So after disabling every blade it had, we still had the same results. So after some time and frustration, we finally replaced the cat5 patch cable between the check point and next hop router and that resolved the problem. Sometimes, these kind of problem can drive you crazy. 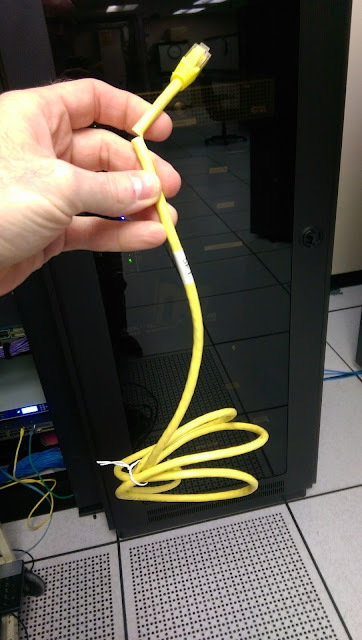 I found it fitting to cut this cable.